• Horse Power: 1HP • Cooling Capacity: 9700BTU/H(3070-10600) • Power Input: 890W • Refrigerant: R410A • Energy Saving Function: Yes • EER(BTU/W): 10.7 • COP: 3.1 • Energy Rating: 5 Stars • Power Supply(V-Hz): 220-240V~ 50Hz • Air Volume(m3/min): 9.8 • Noise Level dBA: 21 • Dimension (mm) - Indoor (W×H×D): 877 x 292 x 222 • Dimension (mm) - Outdoor (W×H×D): 598 x 495 x 265 • Powerful Jet Mode • Lock-On Sensor • 14m Long Air FLow • Coanda Airflow System • Baby Mode • Quiet Operation • Best Sleep mode • Self-Cleaning • Inverter controlled operation enables quick-cooling operation while limiting functions in temperature and reducing power consumption • Long airflow sends cool air travelling upward and across the room to provide gentle even cooling • Eco mode reduces electricity costs and prevents over-cooling by adjusting power consumption in two steps • Coanda airflow system sends cold air travelling up to the ceiling during cooling operation to avoid direct airflow • Powerful jet mode delivers powerful blasts of cool air to rapidly reduce room temperature • Best Suit for room up to 12 x 12 Feet • *Installation is not included in the price. Cool blast air provides fast relief. 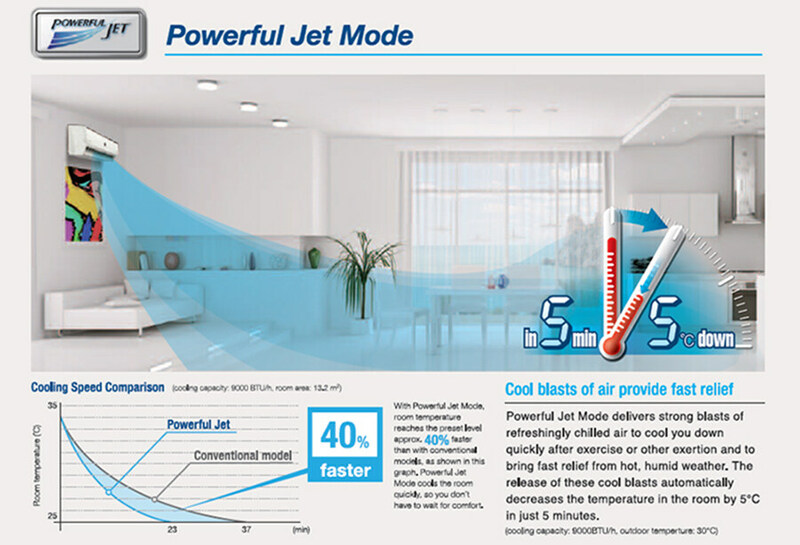 Powerful Jet Mode delivers strong blasts of refreshingly chilled air to cool you down quickly after exercise and to bring fast relief from hot, humid weather. The release of these cool blasts automatically decreases the temperature in the room by 5°C in just 5 minutes. 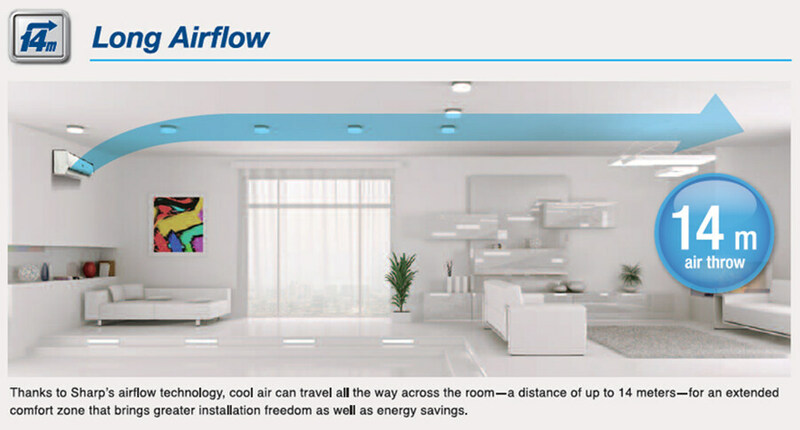 Thanks to Sharp’s airflow technology, cool air is able to travel all the way across the room−a distance of up to 14 meters−for an extended comfort zone that brings installation freedom as well as energy savings. It can provide gentle and cooling air to the room. 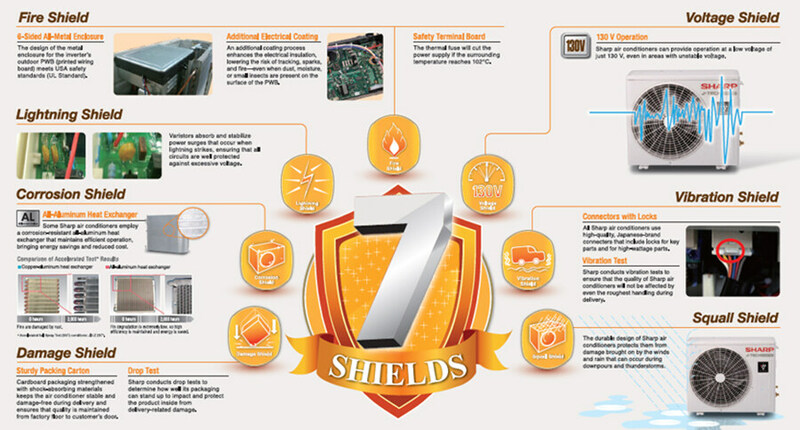 Its 7 Shields Protection consists of fire shield, lightning shield, corrosion shield, damage shield, voltage shied, vibration shield nad squall shield. The design of the metal enclosure for the inverter’s outdoor PWB (printed writing board) meets USA safety standards (UL Standard). An additional coating process is equipped to enhance the electrical insulation, lowering the risk of tracking, sparks, and fire-even when dust, moisture, or small insects are present on the surface of the PWB. The thermal fuse will cut the power supply if the surrounding temperature reaches 102°C.